Spring comes early in the south, and for us Northerners it’s a great getaway, even if just for a long weekend. In a matter of hours after I leave Cleveland, I can bound off a plane, drop my coat and enjoy going for a walk again. Last year this time, Savannah, Georgia was my destination of choice. I had been invited to come and sample Southern hospitality - Savannah style. Having only been there once before for a short meeting, I was really looking forward to returning. Arriving in downtown, one couldn’t but be impressed with the great history of this town and its architectural gems. 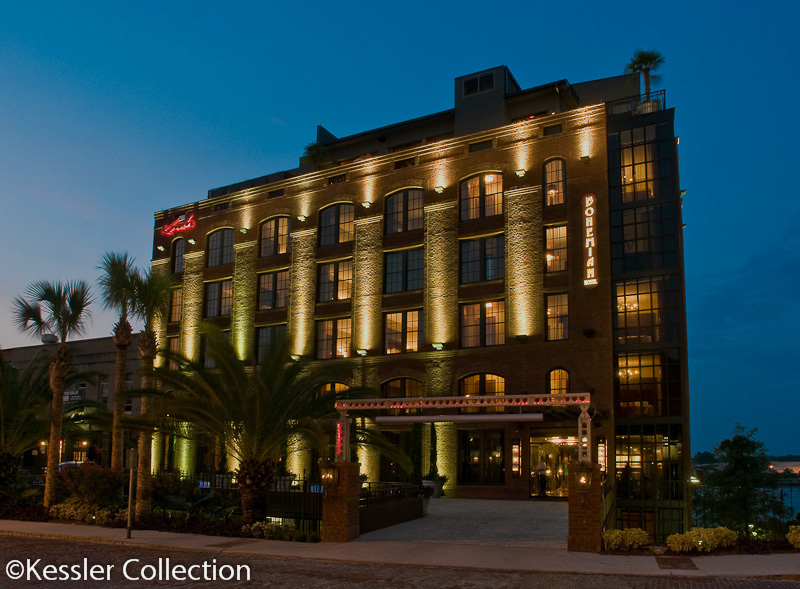 As I pulled into the parking lot of the Bohemian Hotel, I marveled at what a great job they had done converting an old riverside warehouse into a modern hotel. Only later did I learn that the hotel was almost a brand new structure, painstakingly built and decorated to look as though it had been a part of the downtown riverfront for years. Turns out that most other tourists assumed the same thing I did. 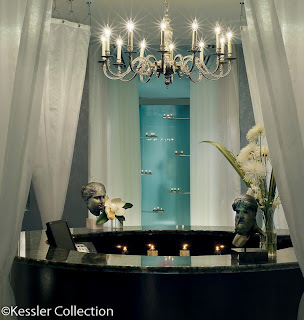 Operated by the Kessler Collection, the hotel exudes artwork everywhere possible. A most generous patron of the arts and Savannah native, owner & CEO Richard Kessler’s private art collection exceeds 10,000 works of art. 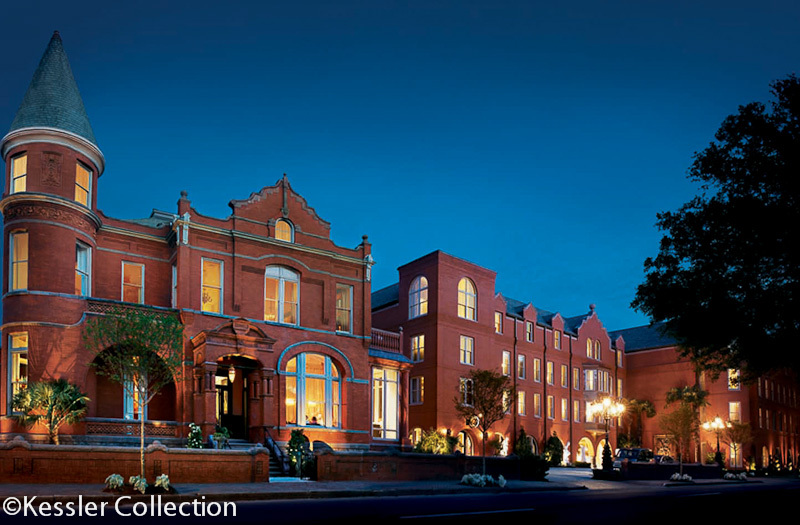 Thousands of paintings, wood and bronze sculptures and multiple-medium pieces of art decorate each of his hotels. You literally slow down to the southern pace to soak in all this art as you wander the corridors and public spaces of the hotel. The rooms are a wonder of floor-to-ceiling windows; furs tossed across the bed, handcrafted, one-of-a-kind light fixtures, and comfy leather chairs. In the bath, a dark wooden hand-carved vanity front sets off the dual marble sinktop. The oversized marble shower with their own collection of toiletries tops off the creature comforts built into each suite. The evening I arrived proved to be a wonderful opportunity to sample the ambiance and views of Rocks on the Roof – the chic rooftop lounge. With glass rollup doors that retract in the mild weather, breezes flow through the bar area and invite you to the railing. With a 360-degree view of the river and the downtown area, it’s proving to be “the” place to meet and mingle. The following morning started with breakfast in Rocks on the River – the lower-level, full-service restaurant, also looking out onto the Savannah River. Every so often, you can enjoy watching the huge ocean-going freighters sail by, less than a stone’s throw from your table. After a most leisurely and filling breakfast, it was off to wander and explore the city. Before leaving the hotel, I stopped by the reception desk and borrowed an iPod with an audio walking tour that explained the sites between the hotel and Forsyth Park. Savannah is laid out so that you barely walk three blocks without wandering through one of their 20+ downtown parks. Each a full block in size, they make wonderful areas to explore and to relax. Each square has a central theme and many date back to the city’s founding in 1733. The largest square has grown into Forsyth Park, complete with bandstand and coffee shop/refreshment vendor operated by the Kessler Group. 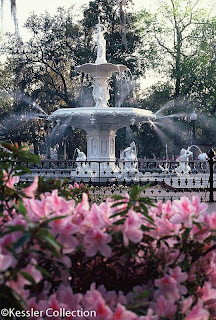 The north end of the park features a circa 1858, multi-sculptured fountain and a fragrance garden which will truly seduce you in azalea season. Immediately to the east of the park is the Mansion on Forsyth Park, the other Kessler property in Savannah. The Mansion is a AAA Four-Diamond, luxury boutique hotel of 126 rooms. This was my next destination for two things I had never done before. 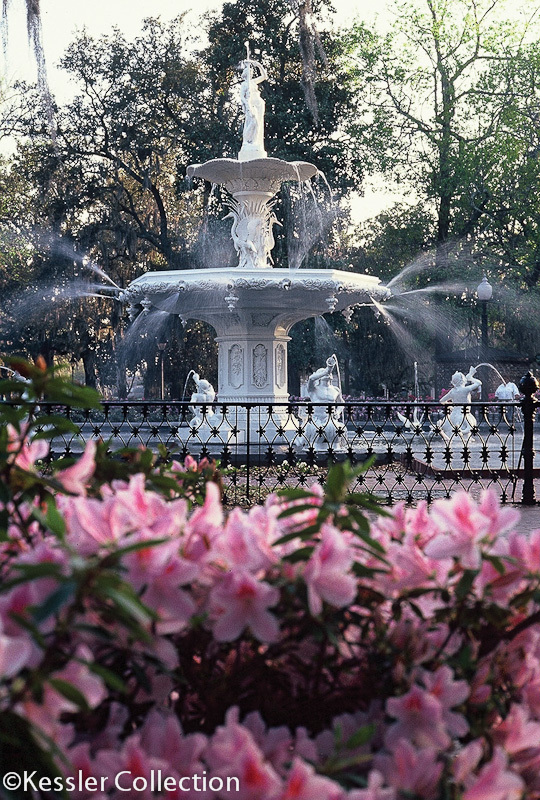 Savannah is known for the foodies it attracts and the chefs that call it home. I was about to take a cooking class with Chef Darin Sehnert at 700 Kitchen Cooking School. A former chef instructor at the Disney Institute, Sehnert took a group of a dozen+ students and first explained the whys and wherefores of Low Country Cuisine, its main food groups and spices. His explanations were captivating and luckily a full booklet of notes were given out so we didn’t need to try to take dictation. He next got everyone into the act of slicing, dicing, stirring and cooking a full blown Southern meal. Excuse me if I brag, but it was the best lunch I’ve ever prepared with 12 of my closest (new) friends. From the mouthwatering cheddar and chive biscuits, to the shrimp in red eye gravy (my responsibility) to fried green tomatoes to the penultimate dessert – pecan praline angel food cake – it was out of this world. My only regret…I had to gulp my homemade pineapple mint tea so as not to miss my spa appointment. After being around as long as I have, getting an upscale massage is something that you just figure is not going to happen. But being on a dream getaway, that’s exactly what you are supposed to do – try something new, experience something you’ve never done before. As I walked into the Poseidon Spa, I was met by Courtney Small, the spa director. Explaining their ten different type massage traditions, we settled on the Swedish massage. 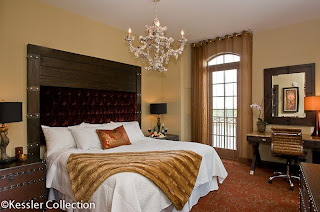 I entered one of their many treatment rooms and was instantly at home with the soft lighting, tasteful décor, and body-temperature massage table blanket-like covers. I could have instantly fallen asleep in this type environment if it hadn’t been for the wonderfully talented masseuse who relaxed and rejuvenated this newfound devotee of the massage. Upstairs, in the hotel, I discovered a gallery showing of Stefano Cecchini’s artwork in the Bosendorfer Lounge. With cocktails and an opportunity to talk with Cecchini himself, it was a great way to bide the time before dinner. He paints luxury cars and large-scale wildlife with the detail that makes you wonder if you are looking at a photograph. Exquisite trompe l’oeil effects on wood are deftly created with oil and tempura. Stunning. Having such a great experience in the Cooking School, I reasoned that I really needed to stay for dinner at the 700 Drayton Restaurant and see what the pros could do without my help. Somehow they managed to do quite well, and I really enjoyed their four course dinner with four wine pairings. For the entrée, they served Tybee Island seared shrimp, with Georgia camembert grits, wild mushrooms and pea tendrils. A Casa Defra 2000 Pinot Grigio was the perfect compliment. While I was in Savannah, their annual music festival was underway and I scored a ticket to see Cherryholmes and Shannon Whitworth perform. Both were extremely entertaining and real crowd pleasers. The following day, before heading home, there was just enough time for a quick trip across the river on the free ferry over to the convention center. It’s a nice short ride and a chance to see the Savannah skyline from a slightly different perspective. The absolute last stop before leaving had to be at Zunzi’s, a quaint, hole-in-the-wall carryout that the locals sort of keep to themselves. They open at 11 a.m. and you want to arrive close to then as the crowd at lunchtime can stretch out the door and down the block (no joke.) I indulged in the Godfather sandwich which combines their own homemade South African beef sausage and chicken on a French bread roll with gravy and onions. Heaven in a 12” hoagie. As I rode home, I immediately wished the getaway weekend had been a month. 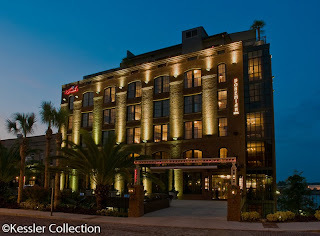 Savannah offers so much to see, do and did I mention – eat? It was the perfect time off before I went back to Cleveland’s winter.